What exactly do you need to be healthy? Founded in 1996 by Rebecca D. Onie, Health Leads envisions a healthcare system in which patients’ unmet resource needs are addressed as a standard part of quality care. 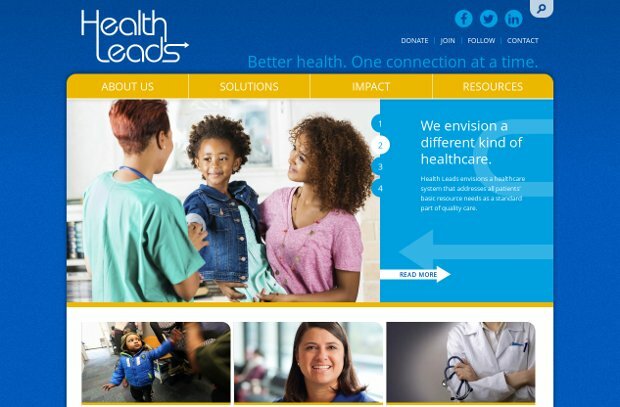 Health Leads’ programme integrates into the workflow of a hospital or health center and enables providers to prescribe food, housing, job training or other resources for their patients. Patients take these prescriptions to the Health Leads desk in the clinic waiting room, where college student Advocates fill them by connecting patients with the resources that they need to be healthy. Last year, the organization trained and mobilized nearly 900 college volunteers serving 11,000+ low income patients and their families in six US cities. Health Leads’ early success was driven by the energy and commitment of the college students who opened the first “Health Leads Desks”. Today, college students remain at the core of the program, serving as Health Leads Advocates. Their work on behalf of patients and their families demonstrates the kind of healthcare system they envision: one that addresses all patients’ basic resources as a standard part of quality care. Their staff, their board, their advisors and a growing community of alumni are committed to realizing this vision. Finally, their vision for change is only possible in partnership with the healthcare institutions that integrate their model into care delivery and the universities that provide a corps of committed college students.